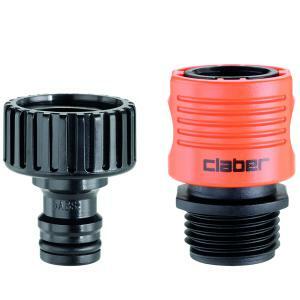 Outdoor Faucet To Garden Hose Quick Connector set easily connects garden hose to outdoor faucet. Includes one female threaded faucet adapter and one male hose connector. Connector and adapter snap together using spring compression. Interchangeable with many quick connector systems. This can also be used between your hose end water timer and drip system head assembly components for easy disconnect when needed.